Fantastic Four is a disappointing reboot of a disappointing superhero franchise, says Nishi Tiwari. Their massive box office collections notwithstanding, the Fantastic Four films have consistently received lukewarm response from superhero film fans. The 2015 reboot of Marvel’s oldest superhero team is no different. 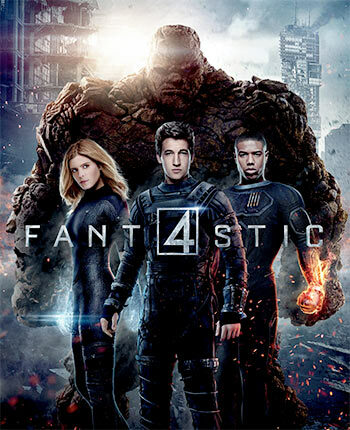 Tim Story’s Fantastic Four, starring Miles Teller as Reed Richards/Mr Fantastic, Kate Mara as Sue Storm/The Invisible Woman, Michael B Jordan as Johnny Storm/ the Human Torch and Jamie Bell as Ben Grimm/The Thing, is devoid of everything it takes to tell an evocative superhero story. Right off the bat, the film opens with a young Reed conducting an experiment with his new friend Ben Grimm in his garage. While the somewhat successful experiment opens exciting possibilities for Reed in scientific research, it also marks just the beginning of a story that unfolds in the most blasé manner ever. Reed ends up at Baxter Research to facilitate better resources for his teleporter under the aegis of a mildly preachy Franklin Storm (Reg E Cathey) -- who can be best described as the most unremarkable mentor ever -- and quickly befriends his son Johnny and adoptive daughter Sue. While Reed himself comes across as the poker-faced Jesse Eisenberg’s Mark Zuckerberg in The Social Network (minus the palpable nervous energy), Mara’s Sue Storm seems as if she is sleepwalking through her days in the lab, doing things she supposedly is passionate about. Little time is invested in fleshing out the key characters, no backstories are offered and all the bonding time the key characters get in the film seemed glaringly rushed. Do we really believe the Fantastic Four are on their way to becoming a close-knit group who would do anything for each other? Not quite. The action sequences and scientific theories of this film will strike as half-baked and devoid of sense even to a superhero movie novice. The antithesis, Dr Doom played by Toby Kebbell, falls flat despite showing promise early on. Fantastic Four tries really hard to be cool and witty, but the only thing fantastic about it is the way it manages to make superheroes seem unremarkable.